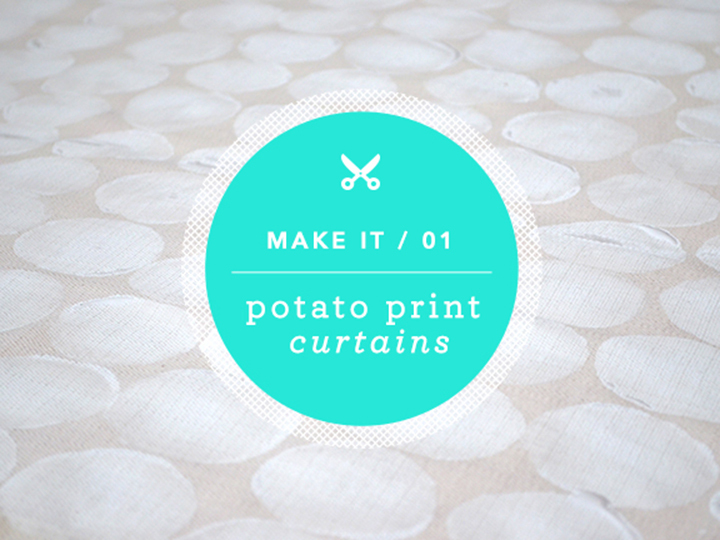 Potato printing is such a fun, easy way to incorporate pattern into everyday items. It's incredibly cheap, and the imperfections make each piece unique with handmade charm. For months, I've been scouring the internet for fabric to make curtains for our laundry room, which is also the back entrance to our house. It's a high-traffic area and each time I walk through, I get frustrated with the lack of pattern and personality the room has. This weekend, I decided to take the bland curtains we already have and add some pattern. If it turned out terribly, I already planned to replace them and if not, it would be a cheap victory! I bought acrylic paint, foam brushes, a foam roller and mini tray and got started. Before getting started, lay a towel down on top of cardboard to absorb the paint and create a smooth, flat surface. Choose a few different sized potatoes to create variety. The shape of the potato determines how big or small your oval will be. Slice the potatoes in half, keeping the knife as straight as possible. If you are creating a different shape, trace the shape onto the potato and carve away the excess. If you want to create a pattern and maintain it, number your potatoes with a Sharpie. Blot the potatoes to remove the moisture and apply paint with the foam roller or foam brush. Depending on how porous your fabric is, you may need to coat the potato more liberally with the paint. 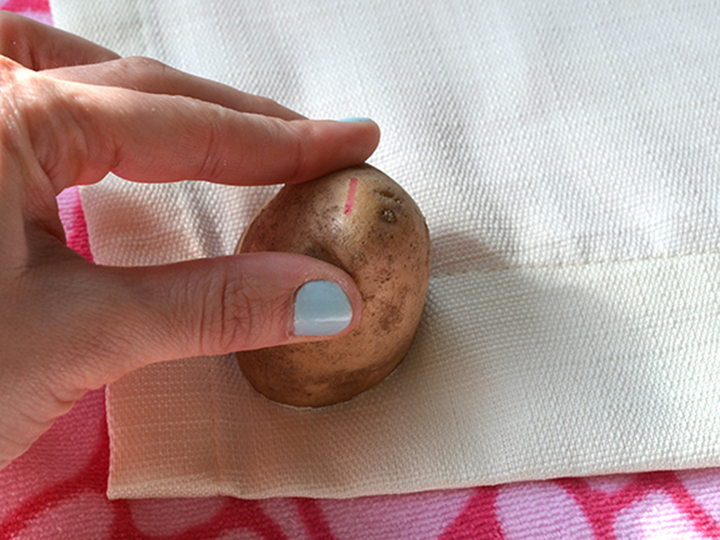 Hold the potato as straight as possible and press firmly onto the fabric. The imprint won't always be even or perfect, but the inconsistency is what makes the pattern unique. Continue to apply the paint and press onto the fabric, creating whatever pattern you envision. When you are finished, let the paint dry overnight. Once the fabric is dry, iron it to set the paint. This will allow you to wash the fabric and not risk losing the color as quickly. Voila! I'm so happy with how they turned out. The curtains really bring character and personality into the room, and I'm impressed with how easy (and affordable) this was. The pattern reminds me of Marimekko's Siirtolapuutarha Räsymatto surface pattern (good luck trying to pronounce that!) that is on hundreds of products, and I love that we have our own homemade version that is Finnish-inspired. Have you tried stamping with potatoes before? I am now on this kick of wanting to cover anything and everything with patterns and potatoes. Let me know if you try this out!